Pool covers are used to safeguard your pool from different debris so that water in your pool is clean and fresh. These pool covers are helpful during winter for they help in protecting the interior of your pool from cold-based harm. And as the time comes to remove the cover in spring, most likely, debris are present on the top of the cover but pulling the cover incorrectly might lead to the fall of debris into your pool. To avoid such complication, make sure to clean the debris first before you remove it. A leaf blower is used to blow away leaves, so use it on top of your pool cover. If your cover has gaps, just take extra care in using the blower. Just make sure that the top surface is hit the airflow instead of blowing under where it may result in the pool cover partially detaching. 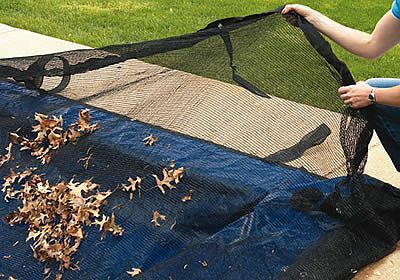 If swimming season is over, a leaf net is used above tarp pool covers. It works by catching all the leaves of the trees until it has stopped shedding for the autumn; just take the leaf net after and shake off the leaves into a compost heap or pile them for pick up. If you are using a mesh safety pool cover or an automatic safety pool cover, then your pool is safe from leaves that might get inside. But, you will have to remove the leaves regularly. Below are a few steps you can follow. If your pool cover has dry leaves, you can use a leaf blower to remove them going to your yard or deck and pile them there. If your pool cover has wet leaves, you may have to use a leaf rake specially made for pool cover use. It is a cheap component that you can easily attach to your pool pole. Pick and move the leaves from the pool cover and into the deck. Preferably, you must let the leaves dry first before scooping them to lessen the weight. You may also haul them straight into a trash bin that has holes in its bottom to discharge the water. So your job will be a lot easier, a pump may be used to take away water from the pool cover. You can also utilize an automatic pool cover pump that will automatically start if water starts to mount up. If you are using tarp type cover and it sags and there is water in your pool, you can put a big inflatable ball underneath the tarp to prop it a little. This can help in lessening a number of leaves that can accumulate in the pool’s center.